They say silver is notorious for "Volatility." On June 25 Dr. Steve Sjuggerud said silver was hated after peaking with investor optimism. Today looked like they set the low. Shop closed for the summer? I haven't seen you on stocktwits. Would you consider it? Some of you goldbugs out there in hiding might also want to show us more of your technical charts also. Written by someone paying attention over at the Free Republic site. • Starting in 2013, the bill adds an additional 0.9% to the 2.9% Medicare tax for singles who earn more than $200,000 and couples making more than $250,000. • For first time, the bill also applies Medicare’s 2.9% payroll tax rate to investment income, including dividends, interest income and capital gains. Added to the 0.9% payroll surcharge, that means a 3.8-percentage point tax hike on “the rich.” Oh, and these new taxes aren’t indexed for inflation, so many middle-class families will soon be considered rich and pay the surcharge as their incomes rise past $250,000 due to tax-bracket creep. Remember how the Alternative Minimum Tax was supposed to apply only to a handful of millionaires? Taxpayer cost over 10 years: $210 billion. • Also starting in 2013 is a 2.3% excise tax on medical device manufacturers and importers. That’s estimated to raise $20 billion. • Already underway this year is the new annual fee on “branded” drug makers and importers, which will raise $27 billion. • Another $15.2 billion will come from raising the floor on allowable medical deductions to 10% of adjusted gross income from 7.5%. • Starting in 2018, the bill imposes a whopping 40% “excise tax” on high-cost health insurance plans. Though it only applies to two years in the 2010-2019 window of ObamaCare’s original budget score, this tax would still raise $32 billion—and much more in future years. • And don’t forget a new annual fee on health insurance providers starting in 2014 and estimated to raise $60 billion. This tax, like many others on this list, will be passed along to consumers in higher health-care costs. There are numerous other new taxes in the bill, all adding up to some $438 billion in new revenue over 10 years. But even that is understated because by 2019 the annual revenue increase is nearly $90 billion, or $900 billion in the 10 years after that. Yet Mr. Obama wants to add another $1 trillion in new taxes on top of this. The economic ironies are also, well, rich. Mr. Obama is now pushing to reduce the payroll tax by two-percentage points for another year to boost the economy, but he’s already built in a big increase in that same payroll tax for 2013. So if a payroll tax cut creates jobs this year, why doesn’t a payroll tax increase destroy jobs after 2013? Mr. Obama is also touting spending cuts he’s willing to make in entitlements in return for bigger tax increases, yet the spending increases built into ObamaCare aren’t even up for discussion in the debt-limit talks. The Affordable Care Act adds more than 30 million more Americans onto Medicaid’s rolls, when that program is already growing by 6.5% this year. So Mr. Obama is willing to cut current entitlements on grounds that they are unaffordable, but he’s taken what may be the most expensive entitlement off the table. my work shows 1549 as a key point. closing above that indicates to me that the market wants higher. the complex looks to me like this correction has run its course. i am looking for higher highs in gold before this leg has run its course and a larger correction ensues. i hope some didnt get snaked out of positions , on the preceding correction. lookign for alot higher #s. 1585, then 1603 are my resistance #s. full moon thursday, i think it will cause a pause, consolidation, pull back for a few days. I was snaked out of 50% because of this QE2 ending scare, back in today 90%, you guys caught the contrary trend again, congrats! 5.8 grams why should I believe him on the rest ? Your just mad because Armstrong's work is showing a correction before the final 5th wave up and hasn't shown up in your work yet. I try to follow this gold in coins thing and ends up at 'opium weights' which was the closest thing to a weight standard way back when. Point is, this is no lasting standard except when dealing in fineness. Armstrong did make a good case for gold is not money because I sure as hell don't won't to pay taxes with gold coins. 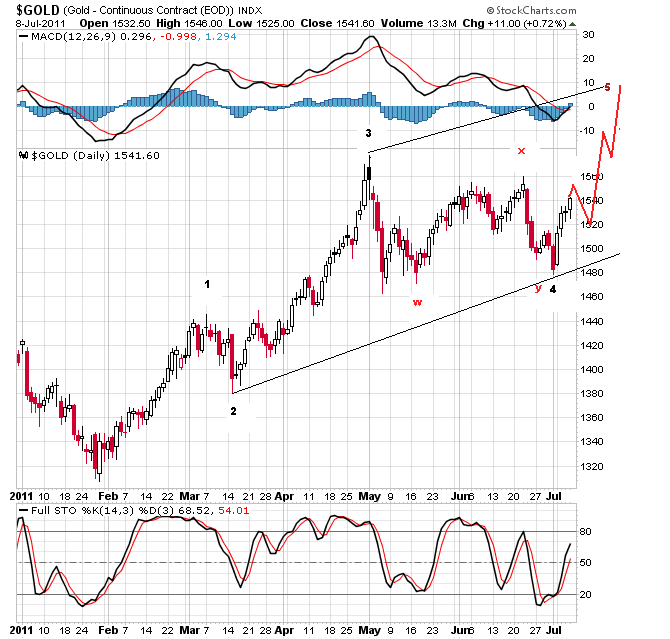 Just about everybody is pushing the dates forwarded for the US$ demise and gold topping, very confusing. Armstrong talks about gold never lasting as a currency then turns around and charts it as an indicator when gold is pretty much worthless as a commodity in industrial uses. Gold has some kind of mystical value and US supposedly has twice has much as any other country in the world. Edit: Dharmaeye, where did you get that Armstrong link? Note you can now get emails on update - see top of site page. Just noticed a new one just posted. I had that link to an Armstrong unofficial website posted at the Free Republic site. Spot high could be in for now and drift lower until around the beginning of August. Wasn't much of a move up so I would expect more sideways action than anything for a couple weeks. yes sir. the man understood markets. running him off was everyones loss. i am looking for cycle highs in august. 1750 is my ideal target. it could extend to october, but my ideal is august. looks like this little correction may have run its course. before that we had 10straight up days in gold for 130 in 10market days. reaching an accord is a given, but in reality it solves nothing. to my knowledge , the usa is the only country w/a debt limit and politicians will always push that limit higher-its a bad joke. 1603 is resistance. above 1640 and we are into a run. all the previous cycle highs for the long cycle have been somewhat of a blowoff this one should @least mirror that or be a little more exaggerated. then as gm shows on his chart. wave 4 and the defaltionary forces take center stage. dont fall in love here.